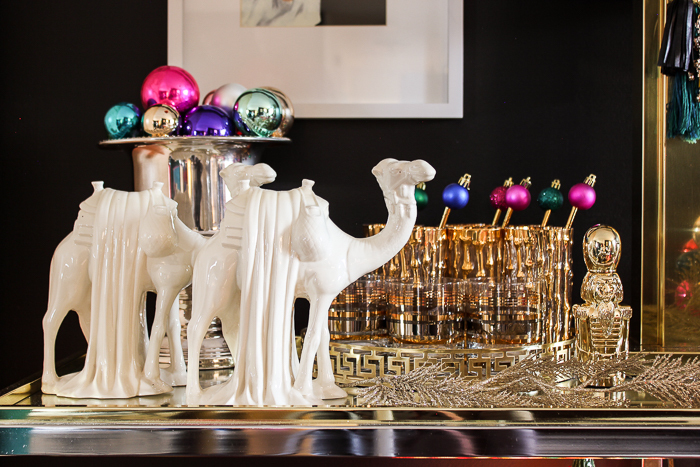 Unintentionally, camels became the theme of my holiday home tour this year. I didn’t mean for it to happen. It just did. I looked around my living and dining room after all the decorations were up and realized I had multiple camels varying in heights of nine inches to two feet looking back at me. We’re just going with it, ya’ll. 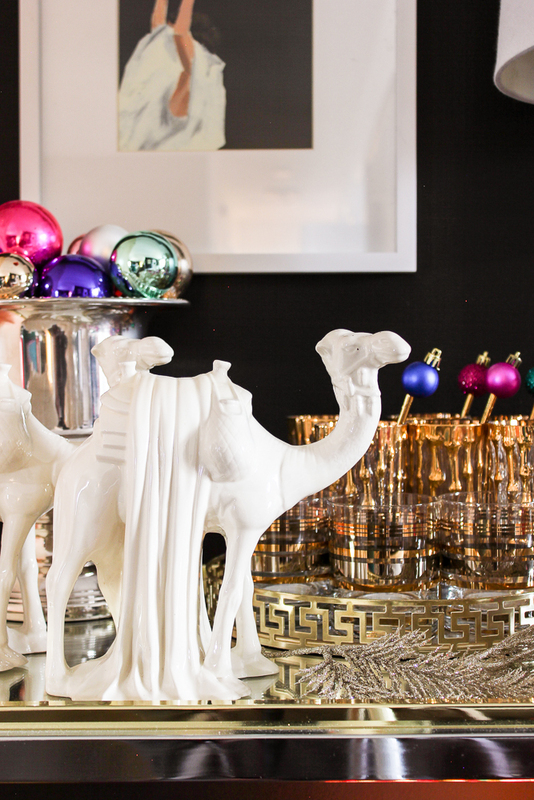 Embrace the camel this season. When Christmas camels become a trend, just remember you saw it here first. 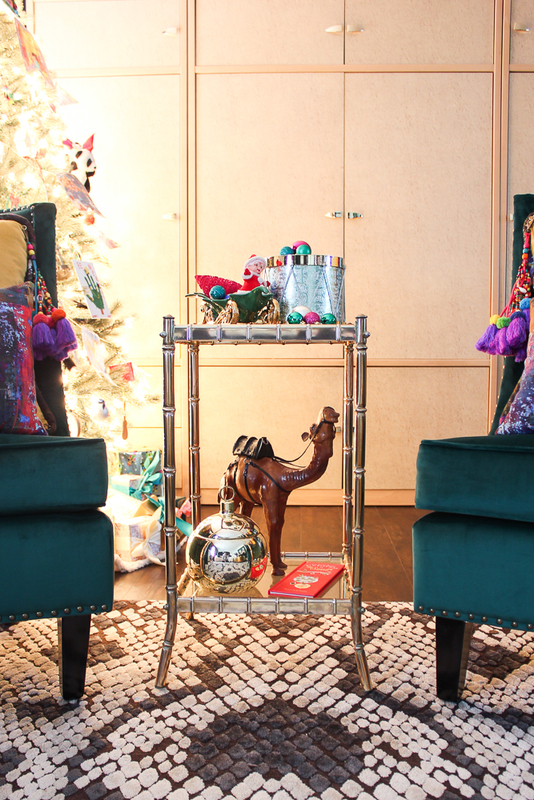 Before you see the camels in all their holiday glory, let me first welcome any new folks here hopping over from Haneen’s Haven as part of the It’s a Colorful Life Christmas Home Tour. If you hadn’t already determined from my camel spill, I’m not all there. We just go with that too around here. Embrace it. 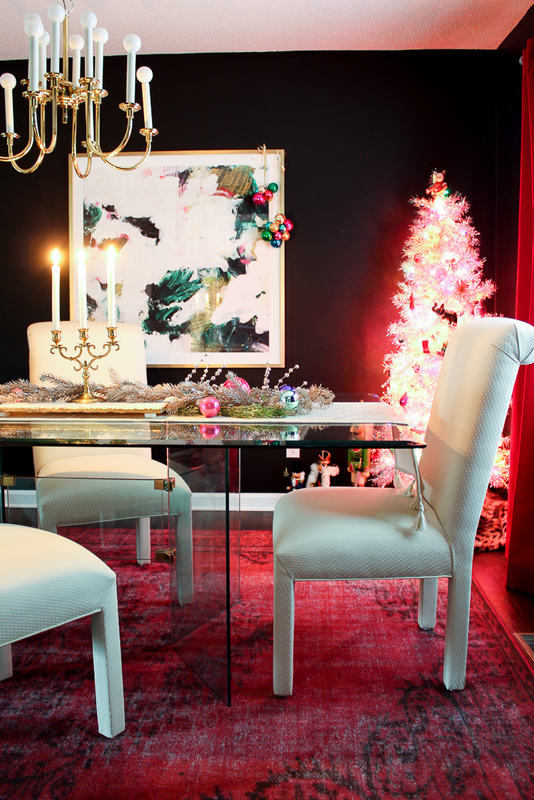 I never really mean to change out and switch up my holiday decor, but it never fails that I end up doing exactly that. And spend waaaay too long debating whether or not Santa should go on the table or Mrs. Claus. Or both. But then what would go where the other was supposed to go? Yea, it doesn’t make sense to me either. Again, just go with it. This little table and quite a few of the things on it are new additions. I scored the table at a yard sale as a package deal with a matching bamboo bar cart for $10. I know, crazy, right? And there’s camel #1 is taking up residence on the bottom shelf here. I’m lucky to have a group of friends who are always on the lookout for each other when it comes to holiday and general home decor. One of those friends, Ashley, found me that pretty camel at a thrift store. I had a great urge to put a holiday attired Barbie on top of him. I abstained. I won’t say it won’t happen before the holidays are over though. And here’s where Mrs. Claus ended up! She was a yard sale find and the sleigh she’s in was a thrift store find. Marilyn made the sleigh in 1985 and I know this because she signed it on the bottom along with the date. Marilyn, wherever you are, I love your sleigh and will take good care of it. That’s why Mrs. Claus is in it and not Santa. Sometimes you just can’t trust a man. See that little drum? It was not that pretty when I found it at the Goodwill. In fact, it was downright hideous. The fabric on it was atrocious. But I deconstructed it, re-wrapped it in pretty wrapping paper and for $0.99 ended up having a damn pretty drum. You can too – don’t pass up the hideous ones at thrift stores. Unless I get to them first, then there won’t be any for you. I’m feeling a drum themed Christmas coming on for next year. 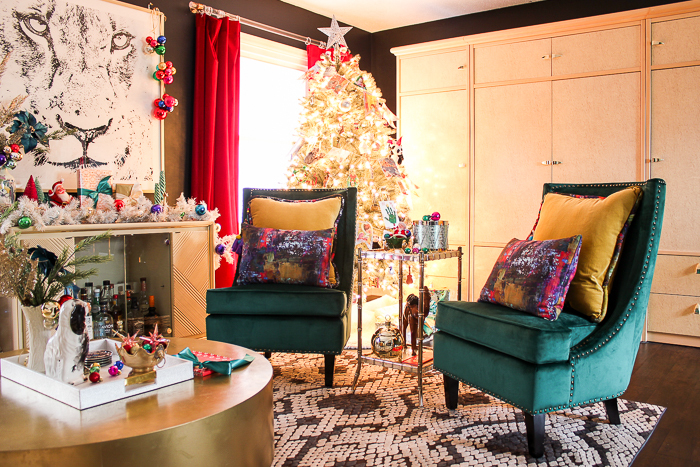 If you are new around here, I’m sorry-not-sorry if you were expecting a beautifully themed color-coordinated Christmas tree. We don’t do that. Our tree sports special ornaments, stuffed animals and even a shoe or two. 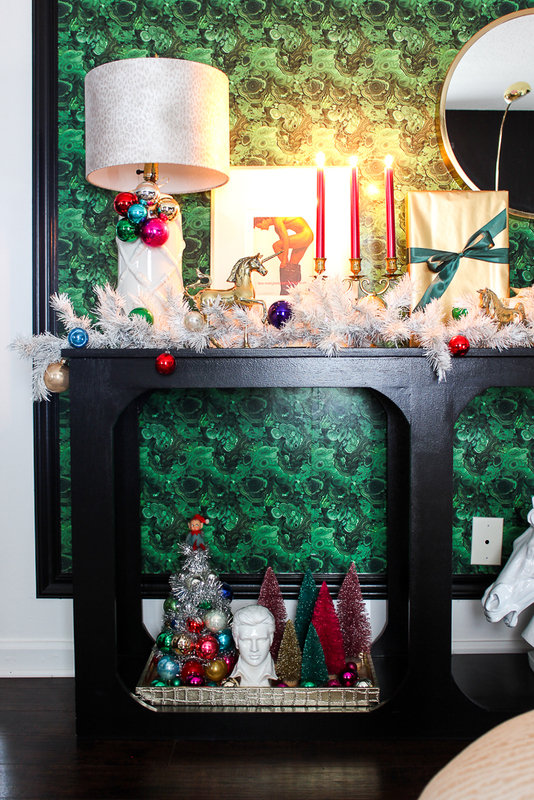 This little vignette is a favorite of mine this year. 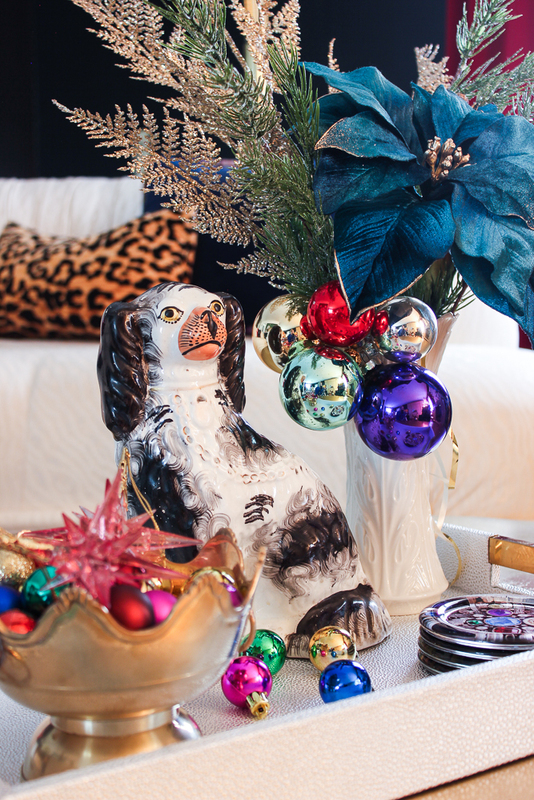 The Staffordshire dog was a Goodwill find from the summer and obviously, it’s not a Christmas specific decoration, but I dare you to find a Staffordshire dog that’s prettier than when surrounded by holiday decor. Also, I’m sure it’s not one of the real Staffordshire dogs, but I’ve never shook at my head at a faux fur before and I’m not going to start shaking it now at fake Staffordshire dogs. Those jeweled coasters are a new favorite of mine as well. I bought a set as a gift this year and loved them so much that I bought myself a set too. They are absolutely the most gorgeous coasters I’ve ever seen. The dog agrees. Sidenote: If you tie pretty satin ribbon on anything non-holiday-esque, it automatically becomes authentic holiday decor. The teal poinsettias are at Michael’s this year. I’m usually not a fan of faux flowers, they tend to be the only faux thing I shake my head at, but these oversized beauties stole my heart the minute I saw them. We’re faux-ever friends. 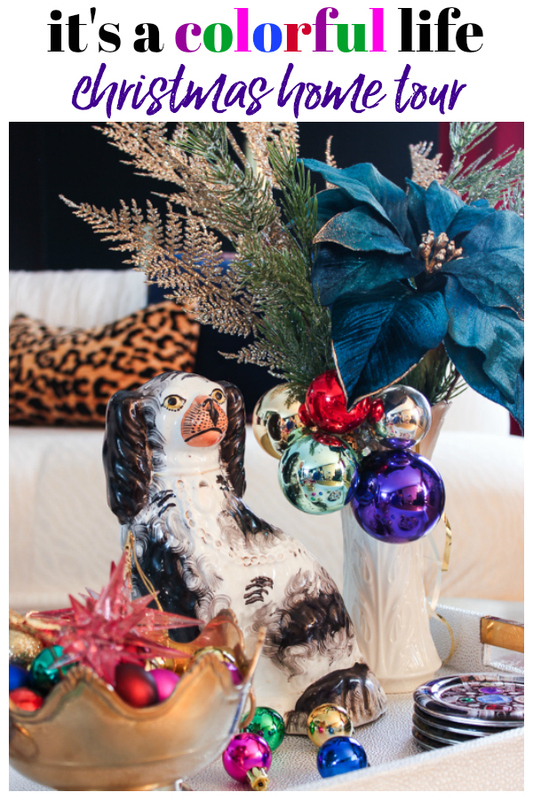 I tied an ornament cluster (find out how to make those here) around the vase for an extra pop of color. And because there had to be something else substantial there to even out that oversized poinsettia. I also adorned just about every piece of oversized art in my house with hanging ornament clusters. 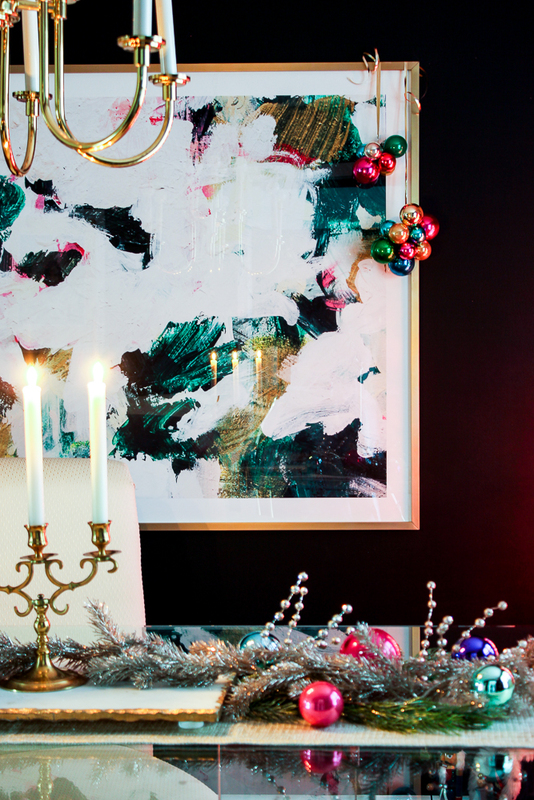 Because you can never have enough colorful ornament clusters around your house for the holidays. Tell me I’m wrong. Introducing camel #2. I spotted him on Facebook one day when someone from my hometown posted pictures of their yard sale and he was in it. My dear Judy, our group mom and also direct line to Jesus, went to pick it up for me. We don’t just call her a saint because she keeps us on her prayer list, it’s also because she’ll also do anything to help us even if it means picking up a stray camel from a yard sale. 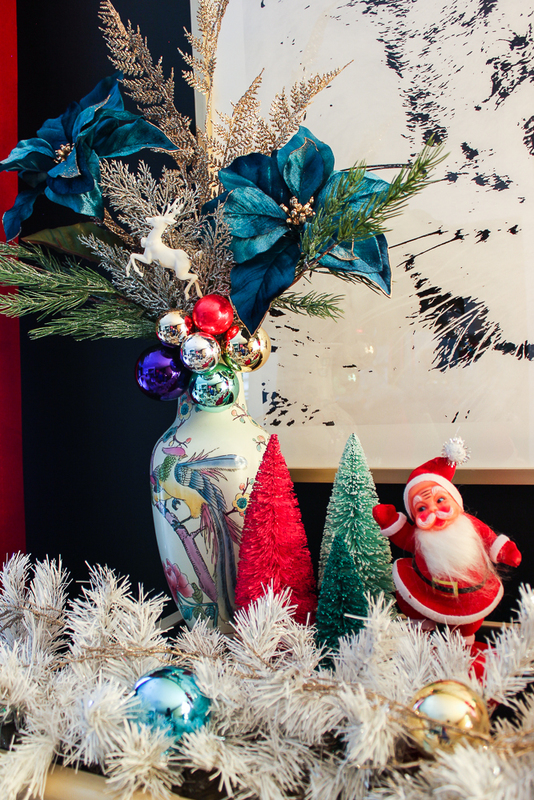 The teal poinsettias struck again in this vase flanked by a vintage Santa and bottlebrush trees. I also bought some extra poinsettias to stash away for future Christmases. 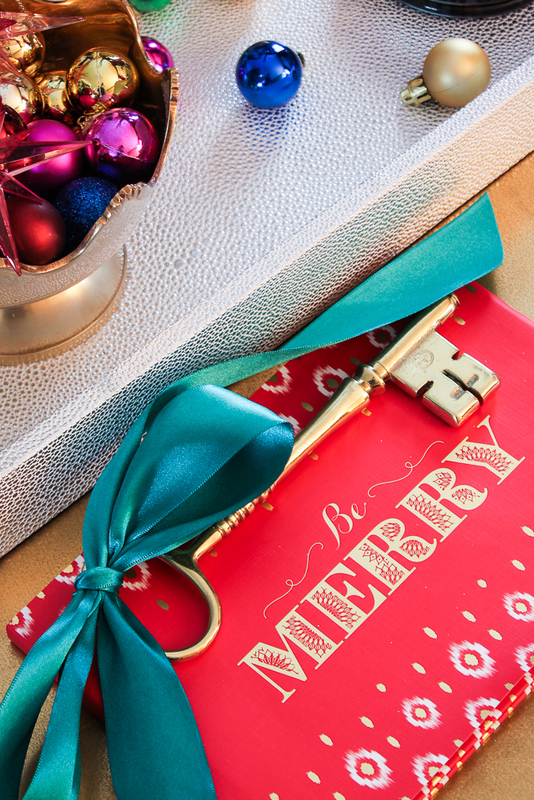 You never know when you might need an oversized faux teal poinsettia. It’s always best to be on the safe side. 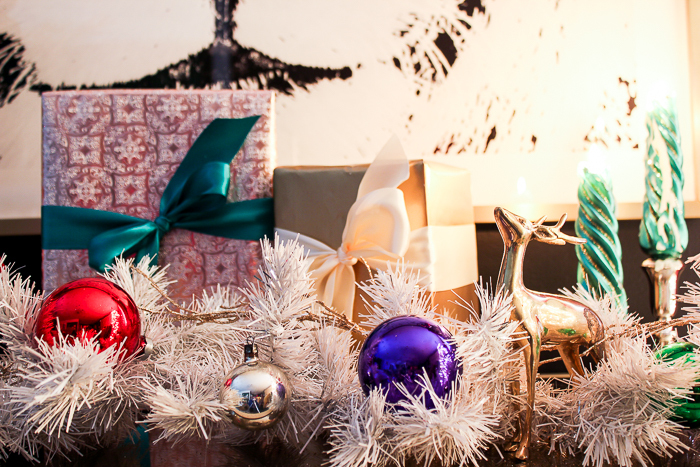 I always cheat and use wrapped gifts as decor around the house too. I mean, what’s the use in going to all that trouble wrapping gifts and making them pretty to just stick them under the tree barely seen all season? Again, tell me I’m wrong. 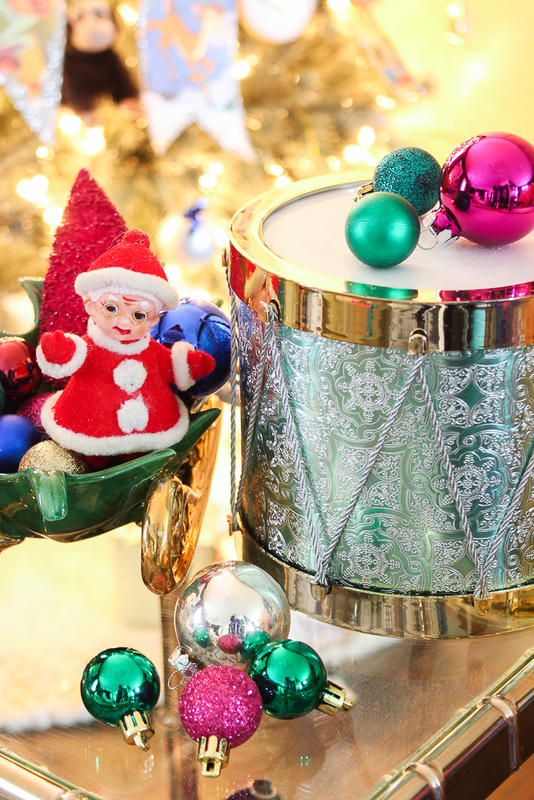 There’s more drums – see I’m already priming for next year’s holiday theme. The dining room is pretty low key, compared to the living room. We use our dining room table for meals every night I cook, so I don’t like to clutter it up too much with holiday decor that I just have to move every night. I’m lazy. I admit it. I added a tree in here this year. I mean, a friend was selling a silver tinsel tree and I had this big box of vintage ornaments I’d bought at a yard sale with no tree for them to go on. I needed the tree. I really didn’t have much of a choice, right? 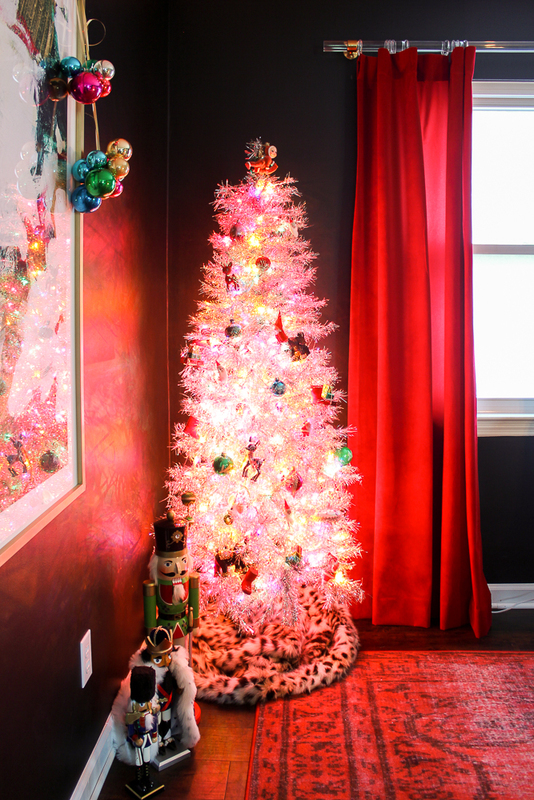 Also, photographing a silver tinsel Christmas tree that has multi-colored lights on it that’s right beside red velvet curtains is like the hardest thing ever. You’re guaranteed to get a redish overcast that may make you question whether or not there are a few demons around trying to steal our holiday joy and take over the souls of the nutcrackers to wreak havoc upon your home. I really hope that doesn’t happen. 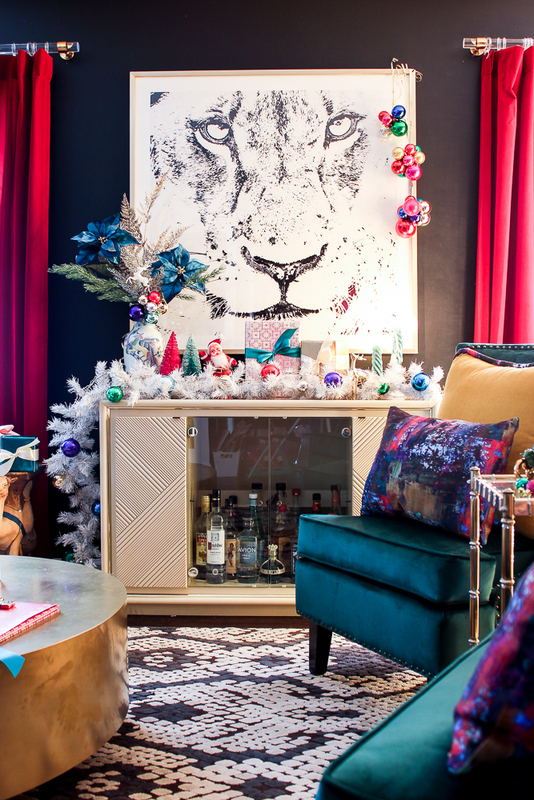 And for the finale, the almighty bar cart. I found these glorious souls a couple of years ago. They don’t get stored away with regular Christmas decor; they have their own special cabinet they go in to make sure they are safe and protected throughout the year. We treat our camels right around here. 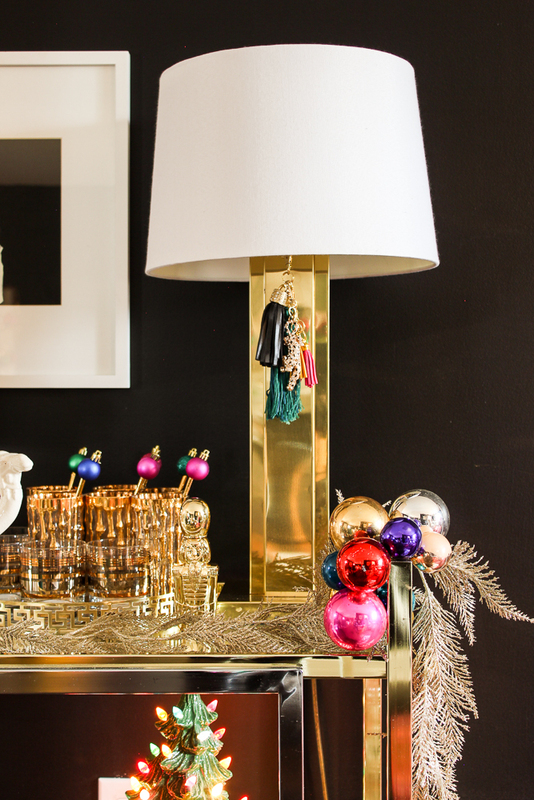 The lamp tassel is something that stays on all year long, but just so happens to work well with holiday decor. Again, it’s really just another way for me to be lazy. 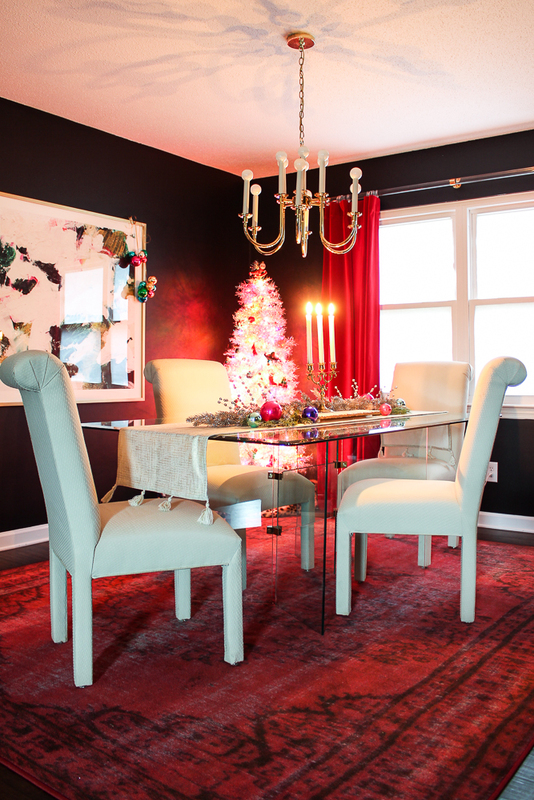 See how to make the lamp tassels here. And of course, I added on an ornament cluster to the edge of the cart for good measure and all. 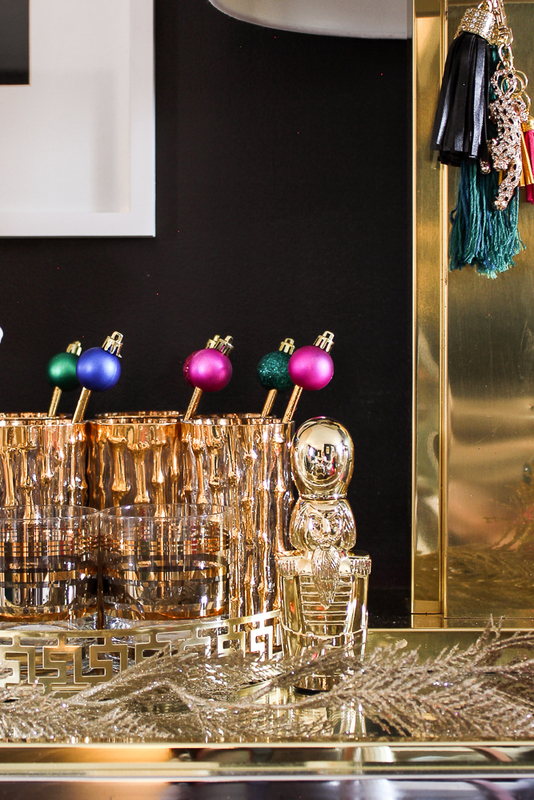 The little golden nutcracker is actually a corkscrew – another thrift store find. You can find the tutorial for those mini Christmas ornament drink stirrers right here. it will take you all of 10 minutes to make them and your holiday guests will think you’re totally the hostess with the mostess and not the hot mess that you really are. Or at least, that’s the case with me. To summarize this post, hand-to-God, I was legit sober during the writing of this post. This is the normal me. And that folks, is terrifying. Up next is Mum Little Loves – I’m sure she’s sane, y’all. Catch any homes you missed with the full It’s a Colorful Life tour lineup below! AHHHHHHHH!!!!! I LOVE IT ALLLL!!!! I don’t even know where to start, but the colors, the glam, the style! I adore you! You are too sweet, Jewel!! Thank you so very much! Love all the color and of course the camels! I spied a lovely lamp shade on your console table. Any chance you have a link to those? Kind of looks like snow leopard 😍. Thanks, Regina!! That lamp shade came from At Home. It is kind of like a snow leopard shade. It was only like $20 too I think. I looked for it online, but couldn’t find it. If you are in the market for a new lampshade or two, I highly suggest looking at At Home – they have a huge selection of really pretty ones, that aren’t expensive. Sometimes those patterned or colored ones are just outrageously expensive, but not there! Ok it’s official- your Christmas decor is MY FAVORITE!!!!!!! It’s just so fun and whimsical and it goes together so well – definitely going to pin a few pics for inspiration for next year!! Thanks so much, Kelly! You made my day! I love for it to be pretty, but putting a few fun touches on it make it, well fun! haha! Thank you so much, Danna! Loving everything. The tinsel tree sure brings back memories!! 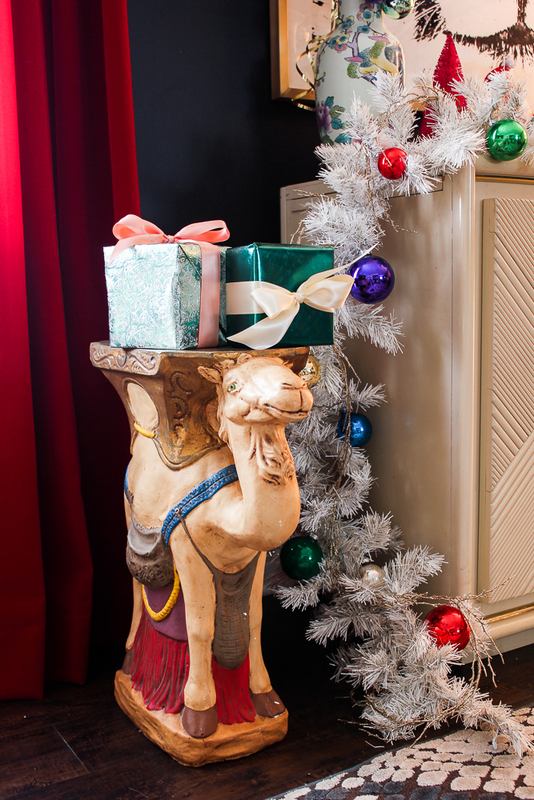 I ended reading through your, “All Hail the Christmas Camel,” with my eyes tear-filled. I, too, would decorate my home with a different theme every year, i.e., nutcrackers; 12 Days of Christmas; early-1960’s Barbie stuff to decorate the tree (it was right after 9/11, and I HAD to do something fun); pears; blue and white (to honor my husband’s Jewish heritage); the three kings; even those red polka-dotted mushrooms, to name a few years. …I have lost my mojo. I haven’t cared about decorating for a few years now. 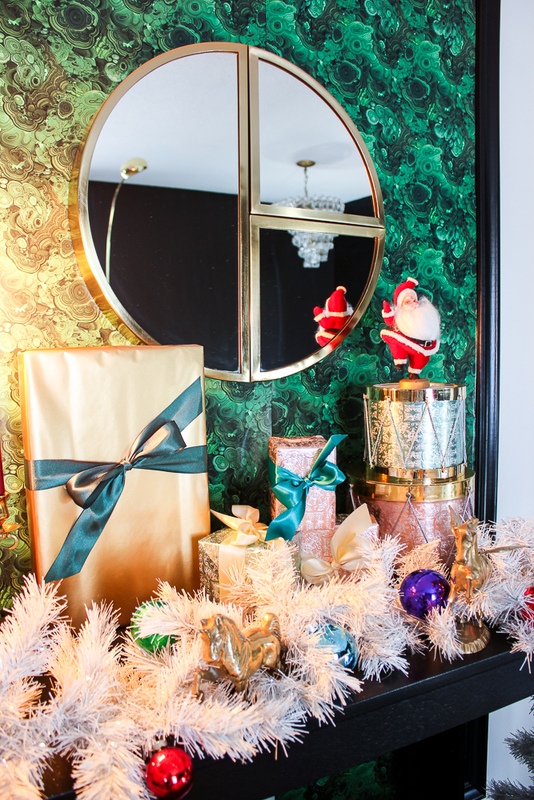 BUT, when I saw your pictures of all the adorable and wonderful ways you created a fabulous Christmas atmosphere for you and your family, I am inspired once more! I vow to jump in TODAY and start creating! Oh Wendy, you’re gonna make me cry!!! I am so honored to have helped a little bit in getting you back in the Christmas mojo! Each of your themes sound like so much fun! I would have loved to see all the Barbie stuff – they were one of my absolute things to play with growing up! I even have a miniature one on my stocking holder! I hope you have a wonderful, wonderful Christmas!! Love it, be BOLD, be BRAVE! And the camels are the cutest ever. Jenna this is so funny with the dog statue. My. mom had one that the came off a base. Gone now. 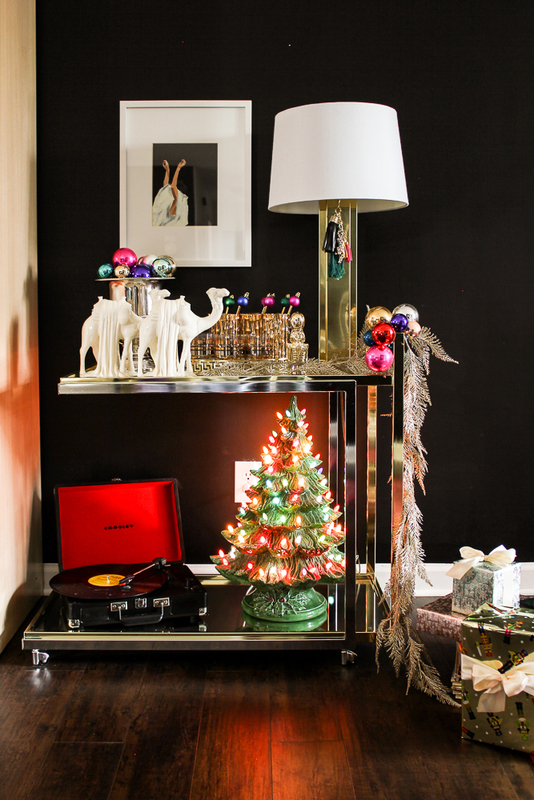 You now need a black tree for downstairs with leopard balls or ribbon and teal pointsettas. What a look. Seeing your house I have get some decorations out. Does not feel like the season. I have so been eyeing one of those black trees, Stephanie!! It would be great downstairs with ornaments like that – gorgeous idea! You know Ms Jenna, some peacock feathers would be great with those teal poinsettias. I would offer mine, but the cat chewed them. Remember I get dibs on the living room lamp. Love all the color. You are so right, Myrna! I’m going to be on the lookout for those peacock feathers for next year now!! Girl, I love to see you do your thing! You have such a unique style that is unmistakably you! I love the personality in your design and am so happy that you joined us for this tour! Thanks, Jennifer! I feel the exact same way about you and your decor!!! So happy to be included in this tour! Can we hang out? Because on decor alone, I feel like we should besties! Right?! I’m thinking the same thing! I love the camels and all the color! Every year I do a different theme. 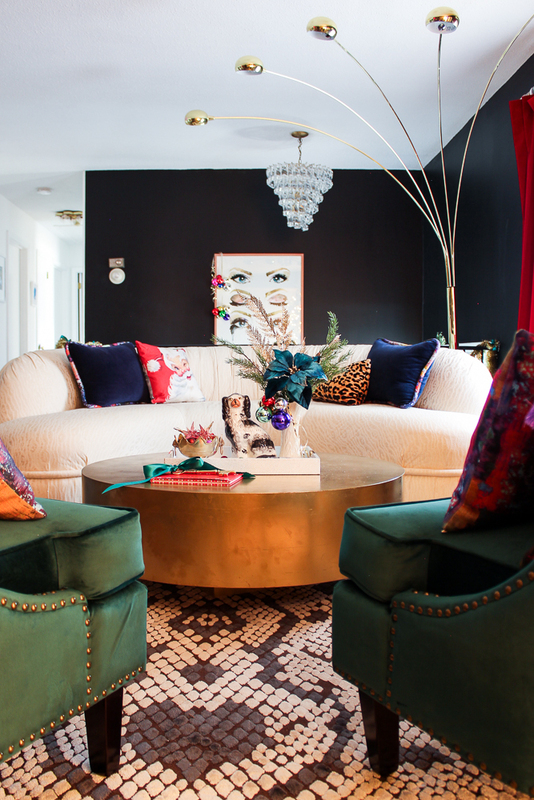 Keep flying the freak flag – I love individuality in people and decorating! Oh I love it, Marci! I bet your donkeys were awesome! I am quite the sucker myself for a good donkey! I love every bit of this! 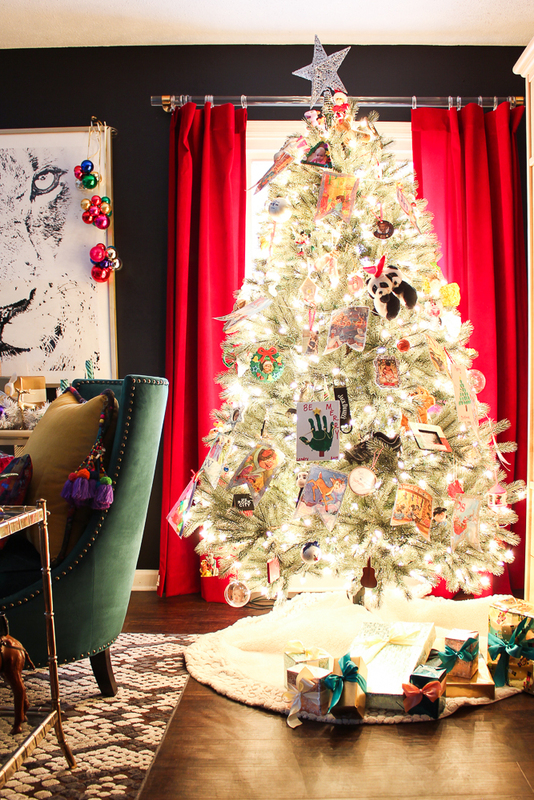 Our tree is like yours, covered with mementos from when the kids were little. A few ornaments from a set in whatever color I decide to go with that year, and the “year” ornaments. 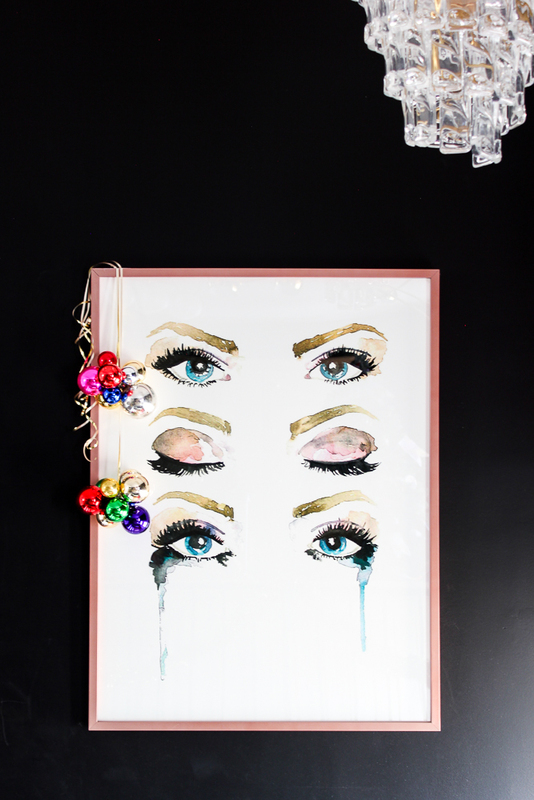 I buy one every year, sometimes they’re crystal or china, sometimes they’re plastic….just whatever happens to catch my eye. I started doing this the year we go married, so we now have 19 of them! I love that yearly ornament idea, Brigitte! We let the Circus pick a new one every year, so we have those. 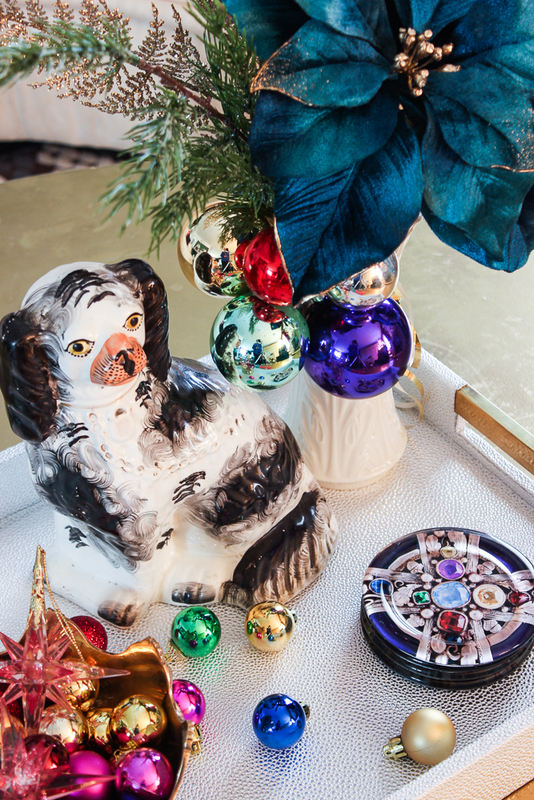 We also get an ornament from every place/trip we take – all those memento ornaments are the best! “I’m sorry-not-sorry if you were expecting a beautifully themed color-coordinated Christmas tree. We don’t do that. Our tree sports special ornaments, stuffed animals and even a shoe or two.” OMG i love this- it’s so refreshing!! I am so tired of seeing the same blog posts over and over lol. My mom and I always wonder how people do themed christmas trees, like where do you put all your special ornaments?!!! I love that dog so much…I would keep him up all year too. 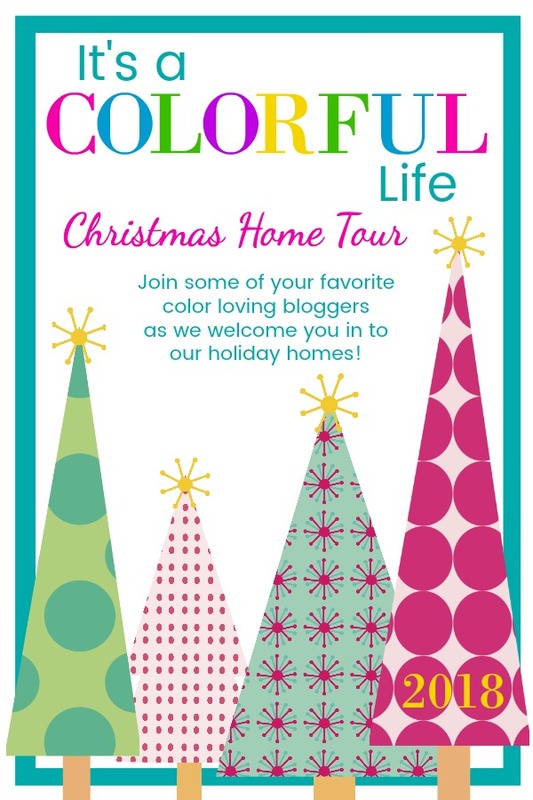 Your home is so pretty and so much fun! I found your blog about a month ago, and thought of you when I saw this today. It would be perfect for your colorful decor! https://www.neimanmarcus.com/p/neiman-marcus-holiday-presents-sculpted-cookie-jar-prod214520544?childItemId=NMHBMH2_ Happy New Year! Thanks, Michelle! That cookie jar is just so fun!! Thanks for sharing that!